The three outer island of the present Krakatau group (Rakata, Seretung and panjang) are thought to be the remnants of one previous, huge volcanic island. Called "Ancient Krakatau", it was some 11 km in diameter and 2 km high according to records in the Javanese "Book of kings" it exploded and collapsed, perhaps in prehistoric times but possibly as recently as 416 AD. Three island remained on the rim of its submerged, 7 km diameter, central caldera (Collapsed crater). The south easternmost of these, Rakata, grew by volcanic activity until it was about 830 m high and 5 km in diameter. Two smaller volcanic island, Danna (450m) and Perbuatan (120 m), then developed in line and to its north, within the ancient Caldera the three island later joined up into one, Krakatau volcano Indonesia. This was about 9 km long and 5 km wide (dashed line in fig.3). 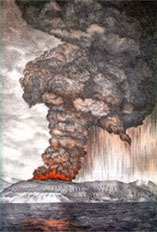 There are records of seven eruptions of Krakatau between the 9th and the 16th centuries. By the nineteenth century it was regard ed as Dormant. Krakatoa (Indonesian: Krakatau), is a volcanic island made of a'a lava in the Sunda Strait between the islands of Java and Sumatra in Indonesia. The name is used for the island group, the main island (also called Rakata), and the volcano as a whole. The island exploded in 1883, killing approximately 40,000 people, although some estimates put the death toll much higher. The explosion is still considered to be the loudest sound ever heard in modern history, with reports of it being heard nearly 3,000 miles (4,828 km) from its point of origin. The shock wave from the explosion was recorded on barographs around the globe. With a Volcanic Explosivity Index (VEI) of 6, the eruption was equivalent to 200 megatons of TNT (840 PJ) – about 13,000 times the nuclear yield of the Little Boy bomb (13 to 16 kt) that devastated Hiroshima, Japan, during World War II and four times the yield of the Tsar Bomba (50 Mt), the largest nuclear device ever detonated. The 1883 eruption ejected approximately 21 km3 (5.0 cu mi) of rock, ash, and pumice. The cataclysmic explosion was distinctly heard as far away as Perth in Western Australia, about 1,930 miles (3,110 km) away, and the island of Rodrigues near Mauritius, about 3,000 miles (5,000 km) away. Near Krakatoa, according to official records, 165 villages and towns were destroyed and 132 seriously damaged, at least 21,007 (official toll) people died, and many thousands were injured by the eruption, mostly from the tsunamis that followed the explosion. The eruption destroyed two-thirds of the island of Krakatoa. Eruptions at the volcano since 1927 have built a new island in the same location, named Anak Krakatau (which is Indonesian for "Child of Krakatoa"). This island currently has a radius of roughly 2 kilometres (1.2 mi) and a high point around 300 metres (980 ft) above sea level, growing 5 metres (16 ft) each year.